You can become a BTCCPC client by signing up for an ongoing weekly/fortnightly amount, for a minimum period of 3 months. Weekly Payments – Ongoing weekly payments of $17 per week. If clients choose this option, the first 4 weeks of payments, ie. $68, is to be paid upon enrolment. Further weekly payments will be payable each Monday by direct debit from your nominated credit card, in accordance with the payment timetable set out in your BTCCPC Application Form. Payments will continue to be debited weekly until cancellation of your Casual Play Card. Fortnightly Payments – Ongoing fortnightly payments of $36 per fortnight. If choosing this option, the first 2 fortnightly payments, ie. $72, is to be paid upon enrolment. Further fortnightly payments will be payable every fortnight on a Monday by direct debit from your nominated credit card, in accordance with the payment timetable set out in your BTCCPC Application Form. Payments will continue to be debited monthly until cancellation of your Casual Play Card. If a payment is declined/unable to be processed a temporary stop will be placed on your benefits and you will be required to supply an alternative method of payment. 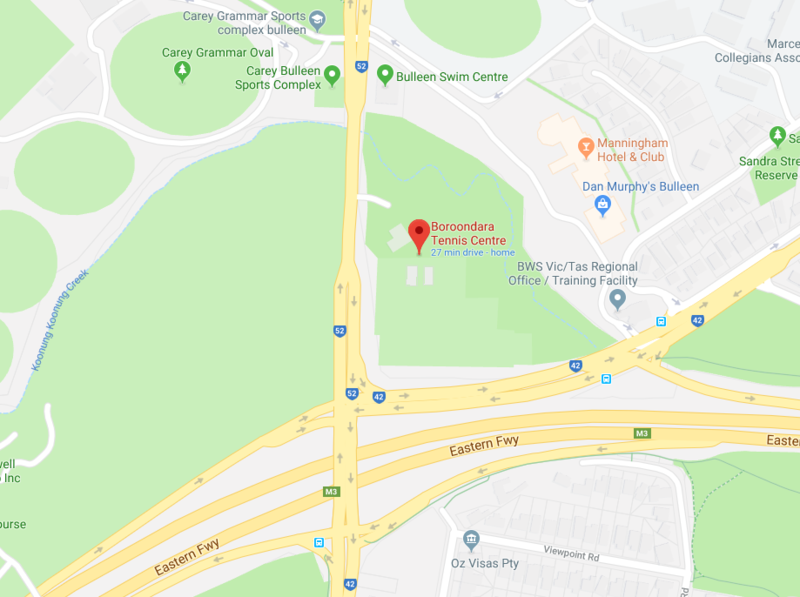 In addition, Boroondara Tennis Centre (BTC) will charge you a fee of $15 to cover administration charges and bank fees. This charge will be debited from your nominated credit card account, with authority being given to do so by enrolling in the program. If there are any arrears in payment (due to administrative or similar error, or for any other reason) you will authorise BTC to debit the outstanding balance from your account in order to bring your account up-to-date, provided that BTC gives you notice of such arrears before doing so. If you owe BTC any other payments, other than in respect of payment of the Casual Play Card, and fail to pay the amount owing within 14 days of being requested to do so by BTC, you authorise BTC to notify any debt collection or credit reporting agency of your default. If you have not paid this money to BTC after 14 days, BTC may also, at its discretion, terminate your Casual Play Card enrolment. At this point you will be required to pay any outstanding amounts plus expenses incurred in collecting or attempting to collect the debt from you. BTCCPC enrolments can be temporarily suspended, for medical reasons only, for a minimum period of 4 weeks up to a maximum of 8 weeks per year. Longer suspensions for medical reasons can be requested, and granted, at the discretion of BTC management. 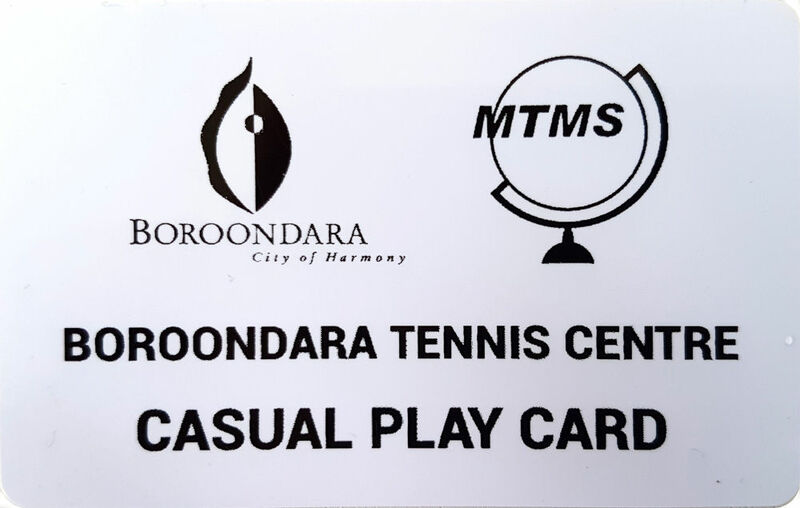 To suspend your BTCCPC you must provide BTC with 24 hours written notice by email, to the Centre’s email address, and made attention to Boroondara Tennis Centre Casual Play Card. A supporting medical certificate must be supplied to BTC within 14 days of your suspension request. Suspensions will not be backdated. BTC will charge you a $10 monthly amount when you suspend your program, ie. a pro rata amount for the relevant period. Once your suspension period has ended, direct debits will recommence even if you have not visited the Centre. If you wish to cancel your Casual Play Card enrolment during the initial 3 month period, you will be required to pay a cancellation fee of $40 in addition to the one further weekly/fortnightly payment. You are entitled to transfer your BTCCPC enrolment to another client. This client must be sourced by you. No transfer can occur until all outstanding payments are up-to-date. The Centre must receive written notice of any transfer taking place, including full details as per the application form, what date the transfer will take effect from, and be signed and dated by both the transferor and transferee. A transfer fee of $25 is payable by the transferee to BTC at the time of transfer to cover administration and new client induction costs for the Casual Play Card. BTC may increase the weekly and fortnightly fees for the Casual Play Card, but not until the current financial year elapses. If the Centre decides to increase the fees, clients will be provided with at least 30 days written notice regarding the increase. BTC reserves the right to change, modify or update the rules and/or terms and conditions relating to the Casual Play Card. Any such changes will be made with reasonable notice given, and displayed prominently in the Centre’s clubhouse and on its website. This will also apply if and when further benefits have been added to the Casual Play Card. All Casual Play Card clients must agree to abide by the Centre’s conditions of entry and basic etiquette that applies to all clients, at all times you are at the Centre. This also applies to any other of the Centre’s rules or regulations you may be advised of from time to time, including the Centre’s privacy conditions and regulations, which are available on the Centre’s website. You acknowledge that tennis and other activities that may be offered or conducted by BTC or under its auspices are inherently physical and that you potentially risk injury by participating in such activities. By signing up for the BTCCPC, and signing the application form, you declare that you are medically able to participate in physical activity, and acknowledge that you understand and accept the inherent risks of undertaking these physical activities. You release and indemnify BTC to the full extent permitted by law in respect of any claim, loss, liability or expense arising as a result of, or in connection with, your participation in any BTC activity. Whilst all efforts are made to ensure your safety, BTC takes no responsibility for injury, damage or loss of property. When you become a BTCCPC client BTC will have access to personal information about you including financial information disclosed by you on your Casual Play Card application form. BTC will only use this information to provide you with services and facilities, and for related purposes, including providing you information in relation to activities, promotions or events conducted by or under the auspices of BTC and its partners. Except where permitted or required by law, or where your consent is obtained, this information will not be disclosed to any parties outside of the above mentioned. You are able to access your personal details from BTC upon reasonable written notice. By using the Centre you consent to your image being taken, retained and reproduced during your participation in BTC programs and activities by or on behalf of BTC. You acknowledge that all photographs, electronic images, sound recordings, video footage and other records obtained by BTC shall remain the property of BTC. You consent to use of these records by BTC in any way, including but not limited to printed applications and visual media such as the internet and other electronic formats without any compensation or notice to you. You understand that there will be no restriction as to which records are used, when those records are used, or the number of times the records are used. The benefits offered in the BTCCPC are not to be used in conjunction with any other offers at BTC. If the Centre’s Pro Shop or any other business involved in the BTCCPC ceases to operate for any reason, BTC will not be held responsible for any benefits that may be on offer but therefore discontinued, which is out of the control of the BTC itself. BTC will, however, do whatever it can to assist the program client in seeking other benefits, but is not held liable to guarantee this outcome. The BTCCPC client can book up to 3 days in advance only when booking court hire, subject to availability, and in accordance with the set days and times specified in the published benefits. - Saturday and Sunday, 9.00 am-6.00 pm. All FREE court hire associated with the BTCCPC is subject to court availability and booking is essential. If the BTCCPC client is using the court hire benefit, the Casual Play Card client would not have to pay his/her share with the other players splitting the balance of the court hire, eg. if a court hire booking is made on a weekend for 1 hour with 4 people playing at a cost of $30 per hour, the BTCBP client receives his/her share for free and the remaining 3 players would pay $7.50 each. The BTCCPC client must always present/scan their client card to BTC staff to receive their benefit. You have an agreement with BTC once you have signed your application form. This agreement, and any supporting documentation referred to in this agreement, contains the entire agreement between you and BTC with respect to its subject matter, and supersedes all prior representations, agreements, statements and understandings made between the parties in connection with it, whether verbally or in writing.